Energy Substation Automation and distributed intelligence across the grid is key to maximizing efficiency of precious energy resources. Speed, scalability and resilience are key for ensure the reliable supply of energy to industry and households. The combination of high performance controllers with the capability to monitor a high number of sensors and to apply complex algorithms for the interpretation of data is an ideal task for Xilinx SoCs and FPGAs. Low latency networks, with zero loss switchover in case of an error, requires the connectivity as defined by applicable standards like IEC 61850, in particular the High Availability Seamless Ring protocol (HSR) or the Parallel Redundancy Protocol (PRP). Security features and HW based cryptography. 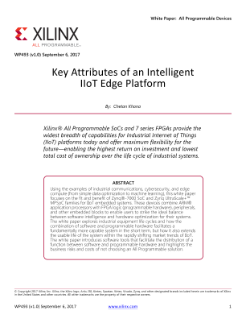 SoC-e is one of the Xilinx Alliance Program partners who focus on substation communication at high bitrates and with proven functionality. Wrapped in these solutions, Xilinx’s products are found in every node of the modern power grid to manage, control and protect uninterrupted and efficient power delivery to the user.